Part 1 Current sportswear market: Market overview; Key trends in sportswear design; Material requirements for the design of performance sportswear; Functional sport footwear. Part 2 Innovative fibres and fabrics in sport: High performance and high functional fibres and textiles; Smart and intelligent textiles and fibres; Coated and laminated textiles in sportswear. Part 3 Sportswear and comfort: Physiological comfort of sportswear; Elastic textiles. Part 4 Protection: Is protection part of the game? Protection against impact using clothing and personal equipment; Protection against cold; Water resistance and water vapour transfer. Part 5 Specific applications: Textile composites in sports products; Textiles in sailing; Textile use in sport shoes. The technical developments in the sports clothing industry has resulted in the use of functional textiles for highly-specialised performances in different sports. Developments include thermal and functional properties and coated and laminated clothes. With bio- and smart materials providing such a strong focus in the textile industry generally, companies are going for ‘value-added’ textiles, such as in-built sensors which monitor performance. In-built wear comfort is a growing market trend and includes clothing which improves the skin’s performance. 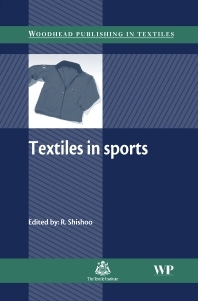 Written by a distinguished editor and a team of authors from the cutting edge of textile research, Textiles in sport discusses high-performance, high-function and intelligent textiles for sportswear. Professor Roshan Shishoo is Director of Shishoo Consulting, Sweden, and former Director of the Swedish Institute for Polymers and Fibres (IFP). A Honorary Fellow of the Textile Institute, he has over 40 years' experience in textile research and development, and is an active member of many scientific organisations and committees.